I haven't been writing every recipe we've tried, but I wanted to share that we have been sticking true to our eating out ban. Well, we haven't paid for eating out once this month, but my mom did pick up the tab when we were on a quick out of town trip soon I don't count that. The picture above is from the night when my husband was craving pizza. 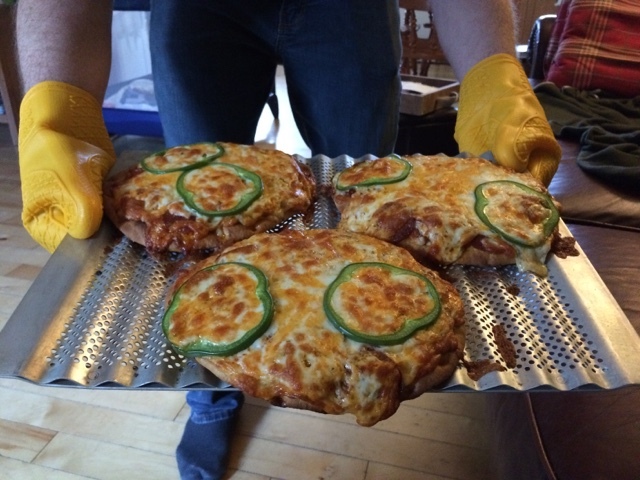 He made these delicious single serve pizza's using naan bread and it went over so well, that he did it again. We also had an Opa! Greek night when he whipped up homemade tzatziki, chicken kabobs and rice - we used the leftover nana bread instead of pita and had a great night! 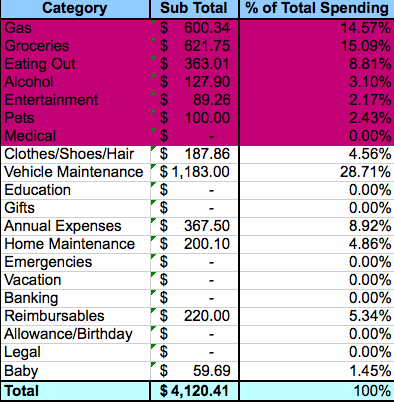 Our day to day spending budget has been positive, rolling over each week and we haven't picked up the credit card once. This is feeling so, so good! After the few posts I wrote about what we should do with the cash from the sale of our house and the sale of my shares followed by a few conversations amongst ourselves. In our continued efforts avoid eating out, and to eat healthily Jordan asked me to pick up something that was crunchy, but not chips. 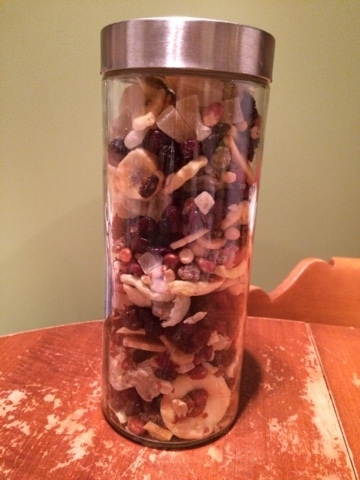 We've had some good luck with a few different types of trail mix from Costco, so I thought I would try my hand at making one from the bulk section at the grocery store. I got a bit excited, and I think next time I could do better by watching for sales (though I did get some one sale). From the size of the bag compared to the bag from Costco which was around $15 - I feel okay about the mix but I'm going to start keeping on eye on the bulk section though, and try to pick up a few things as they go on sale, so that our next mix can cost even less. Guess what guys! The proceeds of sale of the house have been deposited into our account!! Expect a breakdown of what we're doing with the funds soon. Jordan and I finally finished moving everything into storage last week. Instead of renting a moving truck from u-haul, which I estimated would have cost us around $1,500 including gas, three days rental and kilometres - we made the drive to Alberta back to BC 5 times! We used my mom's 10 foot utility trailer and her pickup truck and then unloaded into the storage container we bought a couple of months ago. We spent about $300 more on gas than normal, and spent a few hundred dollars on eating out because of all of the trips - but I estimate we saved at least $1,000 by doing it this way. We were also able to maximize our trips by visiting my great aunt while we were there, and doing some Costco shopping and stocking up on things like TP, paper towel and other Costco type things. All-in-all, I'm pretty pleased how it worked out. It certainly wasn't easy trying to get it all done with Little Man in tow, but a couple of friends and my mom helped out in a variety of ways. This is picture of my latest money saving endevaour. It's my take on a McDonalds Egg McMuffin or a Tim Horton's breakfast sandwich - two of Jordan's favourite morning treats. As part of our efforts to have a zero spend month on eating out, I've been trying to find ways to replace some of our favourite eat out foods while making them healthier at the same time. 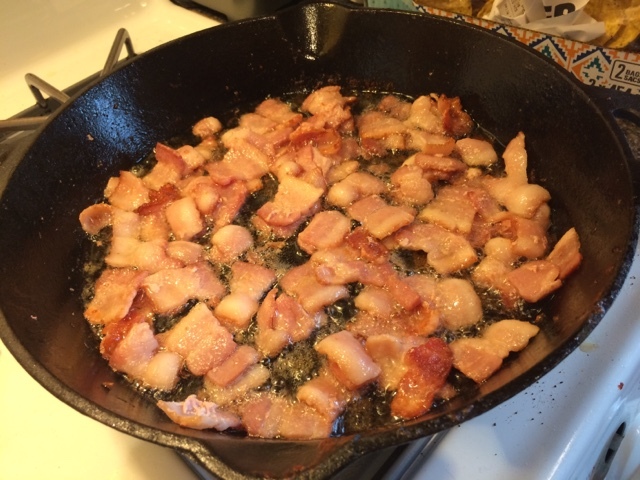 I started by frying up some bacon after I had cut it into pieces. I set that aside to rest on paper towel and then fried mushrooms, green onions, and green pepper in about 1/4 of the leftover bacon grease. Next I beat 8 eggs together and then stirred in the veggies in a large measuring cup so it would be easy to pour. The mixture filled 12 muffin tins about 3/4 or so full. 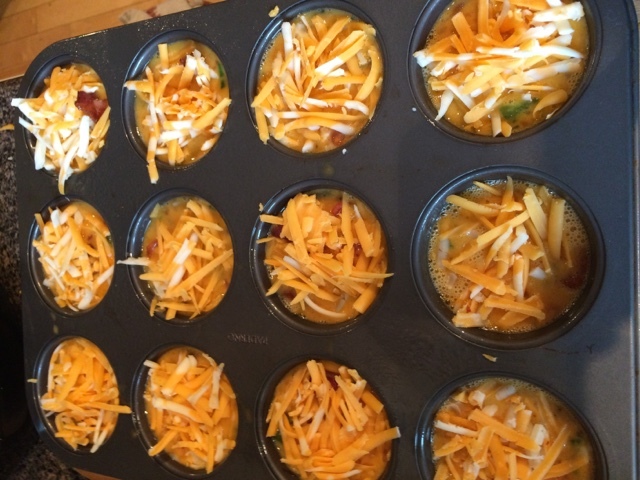 I topped with bacon pieces and cheese and then baked in the oven at 350 degrees for about 20 minutes. 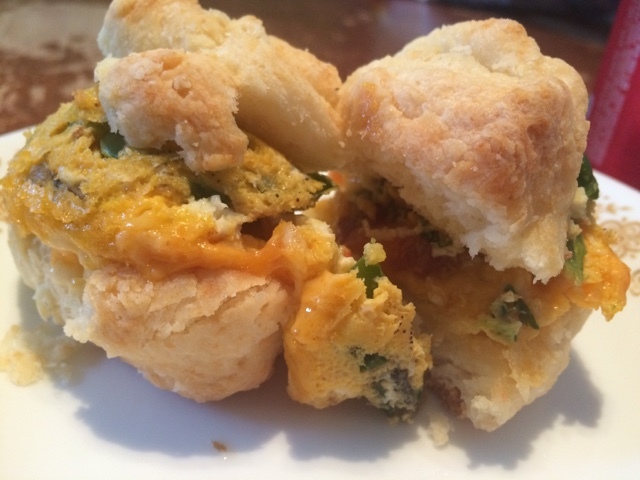 Next up was my families cheese biscuit recipe - I left out the cheese though, because we already had some in the eggs. There, see, healthier lol. On groceries for the egg muffins I spent just over $12. I did some rough math, and tried to account just for the amount that I used, not the amount that was left over in the fridge for the nachos we had for dinner. The biscuits are just flour, salt, baking powder, margarine, and milk - all things that we already had in the pantry so a bit difficult to price out. At Mcdonalds, they are about $3.89, and don't have near the veggies, cheese, and meat that I included in them. So! I'd say a couple of hours well worth it! Both me, my mom and Jordan all thought they were tasty! 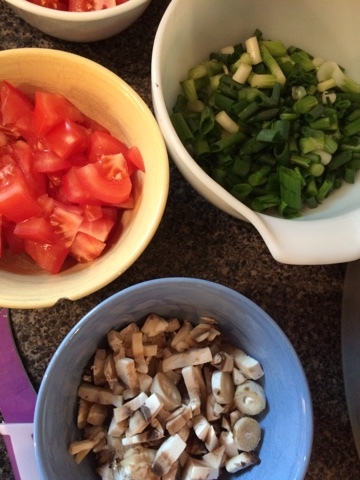 Have you ever tried to recreate a meal from a restaurant or fast food place that tasted better and cost less? To help us stay on track of not eating out this month, I'm going to be trying to come up with healthy and tasty snacks for breakfasts and lunches. We honestly (I know, it's hard to believe), very often have leftovers for lunch so breakfast is the big challenge outside of cereal every day, but there are days when there weren't enough leftovers for all three of us - so having more snacks will be good. I also want to do this without going crazy in the grocery store so want to try to use things that we have in the freezer and the pantry as much as possible. First up is homemade banana bread. 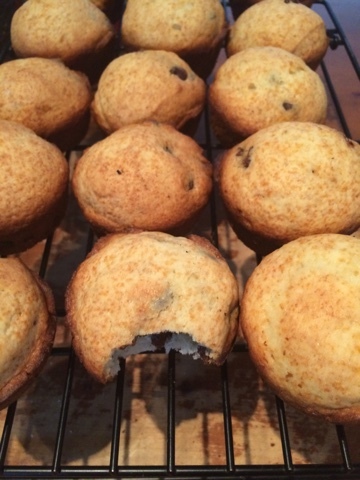 We had 7 frozen bananas which turned into four dozen muffins! Yes, that's my bite mark out of one of them. Yesterday I mentioned that Jordan and I had cut our eating out spending by quite a bit but that we still had a ways to go. To 'reset' this habit, we have decided that for the month of March we will spend $0 on eating out. Jordan actually made the commitment first after reading some of my previous posts. I don't know if we have ever gone a week, let alone a month without a single restaurant or fast food purchase so I'm really excited for this. I'm excited to see what happens to the budget - if we spend more on groceries or not, and if there are any changes to our waistlines. Another month gone...I feel like considering we drove to Alberta five times, we made some real progress here. 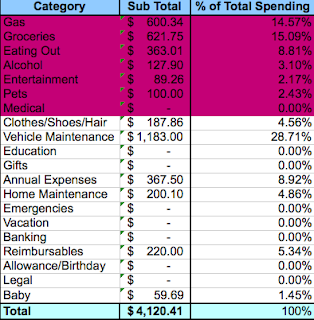 We spent about $230 more in gas this past month, but $161 less in groceries and $175 less in eating out. We didn't quite hit the target of cutting our eating out in half, but I think we made solid inroads. Alcohol went up a touch because Jordan bought a bottle of rum from Costco that will last a couple of months, so up this month but should be down next. I bought new shoes this month so I can wear my orthotics indoors and Jordan got a new haircut. Next is the insurance for the Escape that I mentioned a few weeks ago. The Annual Expense was my HRIA membership to maintain my CHRP designation. Then there were just some odds and ends for the house, Little Man, and some reimbursed trips to the physiotherapist. This month we were just $200 over budget, so, so close! We'll get there in March.